Sat., July 8, 2017, 10:50 p.m.
Can a 6-foot-5 walking redband trout teach a community how to care and conserve one of Spokane’s native inhabitants? More important, can it help the Indians win? 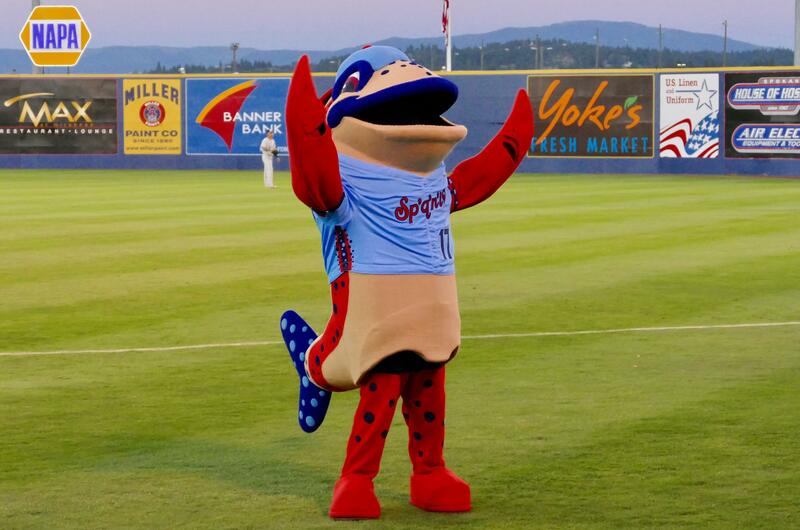 With the Indians rallying twice in a 10-9 walk-off win over the Hillsboro Hops, a whole lot of the 5,704 in attendance at Avista Stadium on Saturday night will swear the team’s new fancy fish mascot had as much to do with the win as the players did. It was a Redband Rally. Or even a redband remedy for a team deep in last place looking for a spark … or speckles, as in the black and red speckles of the redband trout that adorned the team’s new fishified powder-blue uniforms. The mascot was a part of a new collaboration between the team, the city of Spokane and the Spokane tribe to help grow awareness of the local fish’s dwindling population. When the mascot came out in the seventh inning, most of the fans were wearing the new redband rally headbands – think paper Burger King crown, only loaded with fish facts and a jumping trout on the front – no one knew what to expect. With Heart’s “Barracuda” playing over the stadium speakers, the reception was strong. There was cheering. There were lots of photos being taken. There were questions about how big the tank must be to keep a fish like that behind the left-field bullpen. Among those cheering was Spokane Mayor David Condon. Seeing a fish that big begs the question, has the city’s top-elected official ever caught a fish that big? “Of course I have. Haven’t we all?” the mayor asked with a laugh. For nine-year-old Kelton Doolittle, seeing the Indians’ new redband mascot was a special thrill. He’s practically grown up at the ballpark and loves mascots, so much so that he even has his own mascot costume, a dog named PawsE. Once the Indians began working on the concepts for the new mascot back in January and February, Doolittle was right there, giving the team’s Senior Vice President Otto Klein all sorts of input. So, what did Kelton think? And what does Kelton think the new mascot’s signature move will be? Tail wag. Or is it a tail shake? It’s whatever fish do when their tails move fast. He said the new mascot was likely going to give Otto (the mascot, not the team official), Doris and Recycle Man a run for their money. It wasn’t just Kelton who liked the fabulous fish. Hours before the game began, all of the team’s new redband adjustable caps had sold out and by mid-game, all of the fitted hats were gone by mid-game. Hundreds were sold, with donations going to redband trout conservation efforts with each sale. What did the team’s players think of it all? Indians right fielder Chad Smith, who scored the winning run, is not so sure. But a win is win. And a new mascot appears to have instigated the rally, possibly signifying a greater cause to unite Spokane. Or maybe it’s just a giant walking fish that the fans love. Published: July 8, 2017, 10:50 p.m.